Beltline splitting family property, or taking it altogether, in northern Jefferson County (gallery, video) | al.com: JEFFERSON COUNTY, Alabama -- There's a stake with an orange ribbon on it plunked in a row of butter bean seeds freshly-planted in the garden of Margie Fay and Bernard Crawford. Crews from the Alabama Department of Transportation left the stake at the Crawfords' home on Old Springville Road last week, a signal of surveys being done on the proposed route of the Northern Beltline. In a letter dated April 19, transportation officials notified landowners along the 19-mile segment of the proposed route between Interstate 59 near Clay westward to I-65 that they should expect to see surveyors out scouting the area where they expect to build the six-lane interstate connector. 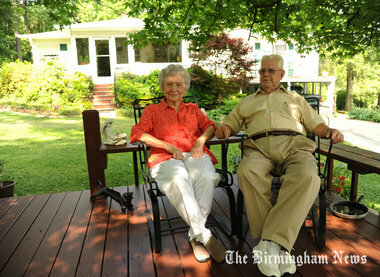 "One of the saddest days of my life was when I looked out and saw the surveyors on my property," said Margie Fay, 85.